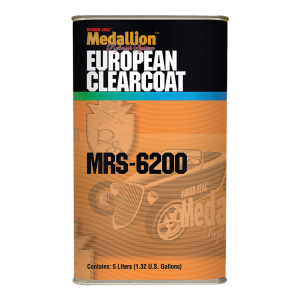 MRS-6200 European Clearcoat is a polyester clearcoat formulated for superior leveling, excellent gloss and easy sanding. This clearcoat utilizes the best UV stabilizers to prevent yellowing. MRS-6200 has excellent adhesion to both acrylic and polyester basecoat systems and is easy to buff the next day or 3-4 days later. It is National Rule V.O.C. compliant and mixes 2:1 with MRS-6360 Fast, MRS-6375 Medium or MRS-6390 Slow Activator. It can be applied in air dry or bake environments. Available in 5 liter cans and in quarts.